I used to write a thing called the Game Diary each weekday. I did it for a previous employer. I did it for my own now-dormant blog. I briefly did it for my Facebook Fan Page (hmmm... maybe I should do something there). Kirby's Return to Dreamland (Wii): I played this maybe two weeks ago and then again a little over the weekend. It's the new side-scrolling Wii Kirby game that eschews last year's great yarn-art from Kirby's Epic Yarn and uses more traditional, bright, squishy polygonal graphics. When I played it a couple of weeks ago it was during a meeting at Nintendo's New York City offices that I was ostensibly attending to play The Legend of Zelda: Skyward Sword. The Nintendo folks were pushing Kirby as an appetizer for my meeting and I consented to try a new level. The details of the level are not all that remarkable: standard side-scroller fare of running to the right while enemies waddle in from the left. Some jumping, some sliding down ramps, and so on. The notable thing was that, as was the case when I saw the game a previous time with Nintendo, Kirby has a ton of moves. The game is very easy, but the simplicity of the combat is compensated by the range of Kirby's arsenal. 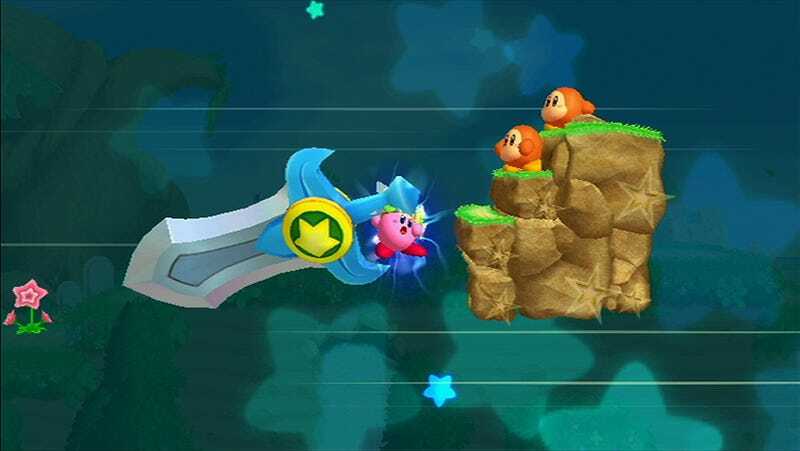 True to his roots, Kirby inhales enemies in the game and appropriates their powers. If he does that with a fire guy, an ice guy, a blade guy or whoever, he winds up getting much more than the one or two new moves I expected. He seems to get about six or eight moves per inhaled enemy. At first I thought the moves were hidden. The Nintendo rep kept calling out different combos for me to hit to make them happen—fireballs, tornadoes, aerial strikes and so on—but the move-sets are all laid out in the game's pause screen. I've found that it's fun to go in there and just zip through all the flashy moved. The varied arsenal is pretty cool and ensures that, as easy as this game may be, it still will offer lots of Kirby combat surprises. Professor Layton and the Last Specter (DS): I started this one on the subway this weekend while I was en route to the New York Comic-Con. I enjoyed the first Layton but didn't find enough spare time for the next two. So I'm jumping back in with the fourth, which is weird, except that this one appears to be a prequel. The problem is that the game opens with long cutscenes, a mistake in handheld gaming that I thought was exclusive to to the PSP and, 17 minutes into my first session, I only found one puzzle. I'm not playing Layton for the story. I want more puzzles, and I wanted them right away. Uncharted 3: Drake's Deception (PS3): I recently tried the Subway-sponsored downloadable release of Uncharted 3's competitive multiplayer mode and proceeded to get mauled and sniped by the random strangers I was match-made with. I am not much of an online multiplayer person, but maybe I would be if I could find more online multiplayer that would be fun even with strangers. Yeah, this stuff is usually much more fun with friends. I know that's the better way to play online, but my life just isn't shaped right for getting friends to play. The only games I trust to not give me a miserable time if I play with strangers these days are Gears of War 3 Horde and Beast modes and Halo 3/Reach match-made multiplayer. At first glance, I didn't see any sign that Uncharted 3 will join that list. That's all I'm allowed to tell you about what I'm playing for now (if only you knew what I was playing this weekend under embargo!). I'll be back with more of this kind of thing... maybe.